BOSTON — Executive Director Allie Hunter McDade is pleased to announce that Gov. Charlie Baker and U.S. Surgeon General Vice Admiral Jerome Adams will be among the featured speakers at this week’s second annual National Law Enforcement Summit. Now in its second year, the P.A.A.R.I. National Law Enforcement Summit is a one-of-a-kind gathering of law enforcement leaders, focusing on their collective work to stem the tide of America’s opioid epidemic. Approximately 400 police leaders from agencies of all sizes will be in attendance at the summit, which is nearly twice as many participants compared to the inaugural summit. The 2018 summit will provide law enforcement leaders with a platform to share ideas on how to build upon, or launch, a pre-arrest recovery referral program that can provide lifesaving resources to individuals battling substance use disorders in their communities. There will be opportunities for television, radio and print/online media interviews, and staff will be on-site to assist media. Law enforcement leaders from the following states and provinces will be in attendance and will generally be available for interviews upon request: Alberta, Arizona, California, Connecticut, Washington D.C., Florida, Illinois, Kentucky, Massachusetts, Maine, Michigan, New Hampshire, New York, North Carolina, North Dakota, New Hampshire, New Jersey, New York, Ohio, Oregon, Pennsylvania, Rhode Island, Tennessee, Texas, Utah, Virginia, Vermont, Washington and Wisconsin. Affiliates may be interested in drawing from their local partners. Boston has NBC (NBC Boston/New England Cable News and Telemundo), CBS (WBZ), Hearst (ABC affiliate WCVB), Sunbeam (WHDH) and Cox Media (Fox affiliate WFXT) television news broadcast stations. The event will also be broadcast live on PAARIUSA.org/livestream. 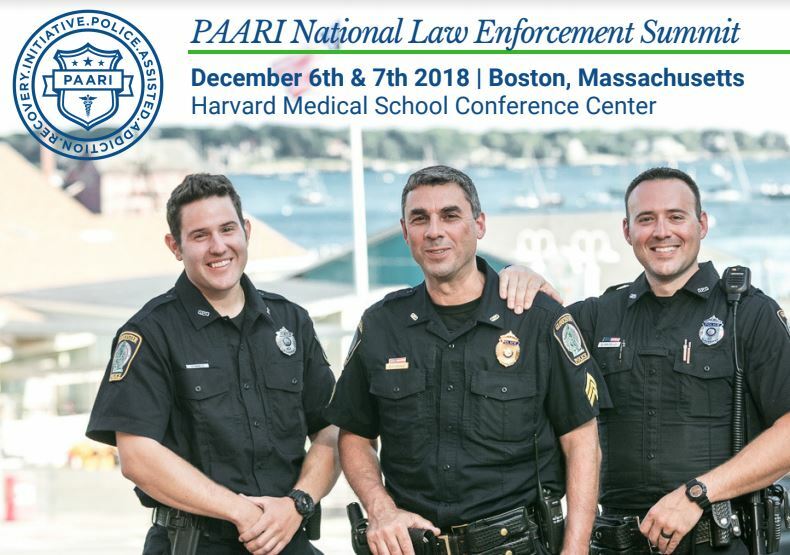 The Police Assisted Addiction & Recovery Initiative (P.A.A.R.I) is a nonprofit organization with a mission to help law enforcement agencies nationwide create non-arrest pathways to treatment and recovery. Founded alongside the groundbreaking Gloucester Police Department Angel Initiative in June 2015, P.A.A.R.I has been a driving force behind this rapidly expanding community policing movement. We provide technical assistance, coaching, grants, and other capacity-building resources to more than 440 police departments in 32 states. We currently work with more than 100 law enforcement agencies in Massachusetts alone. P.A.A.R.I and our law enforcement partners are working towards a collective vision where non-arrest diversion programs become a standard policing practice across the country, thereby reducing overdose deaths, expanding access to treatment, improving public safety, reducing crime, diverting people away from the criminal justice system, and increasing trust between law enforcement and their communities. Our programs and partners have saved thousands of lives, changed police culture, and reshaped the national conversation about the opioid epidemic. Learn more at www.paariusa.org.